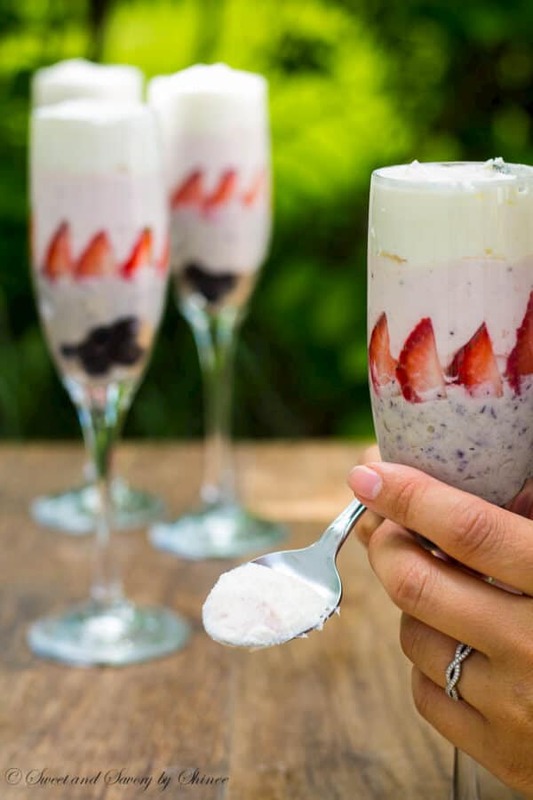 Simple, yet elegant this white chocolate mousse is perfect for your 4th of July celebrations! By the time this post goes up, I’ll be up in the sky on my way to Tokyo, where I’ll be spending a day before heading to Mongolia. It’s going to be a long trip, but I’m so excited for many things. I’m going to finally meet in person with my online foodie friends in Tokyo. Also, I’m dying to see my little nieces and nephew in Mongolia who are growing way too fast. I’m looking forward to spending a quality time with my family and friends over the next month. Exciting stuff, I know. But let’s talk about these delicious dessert to celebrate upcoming 4th of July! 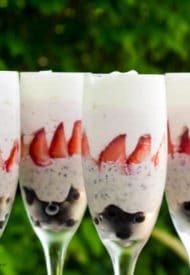 In the spirit of red, blue and white, I’m bringing you this amazing white chocolate mousse. 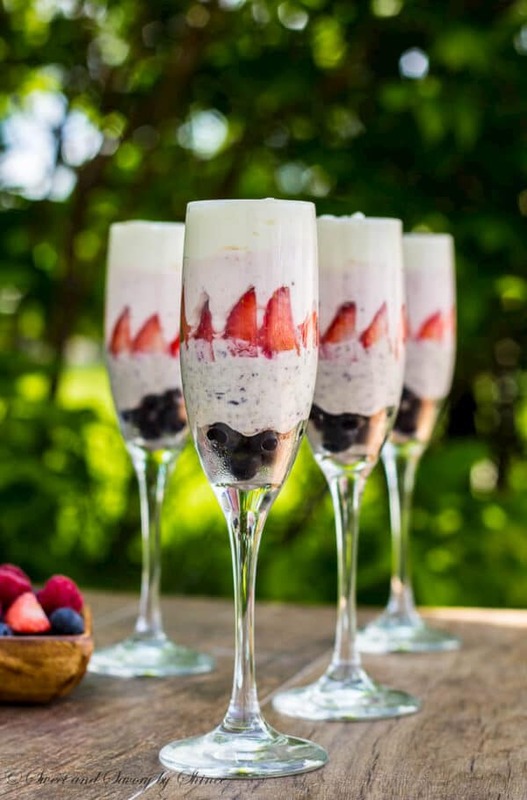 Heavenly smooth white chocolate mousse is divided into three layers and lightened up with pureed strawberry and blueberry for a festive look! There are no egg whites required in this recipe. Thus, it’s super simple and effortless to make, despite its gorgeous festive look. You can use either white chocolate bars, or white chocolate chips. I used white chocolate chips here. Either way, make sure to buy a good quality white chocolate, as it directly affects the final product. The Kitchn shared a few tips on how to choose the best white chocolate. For presentation, I thinly sliced the strawberries for garnish and carefully placed them against the glass walls using long tweezers, but chopsticks or butter knife will work just fine. 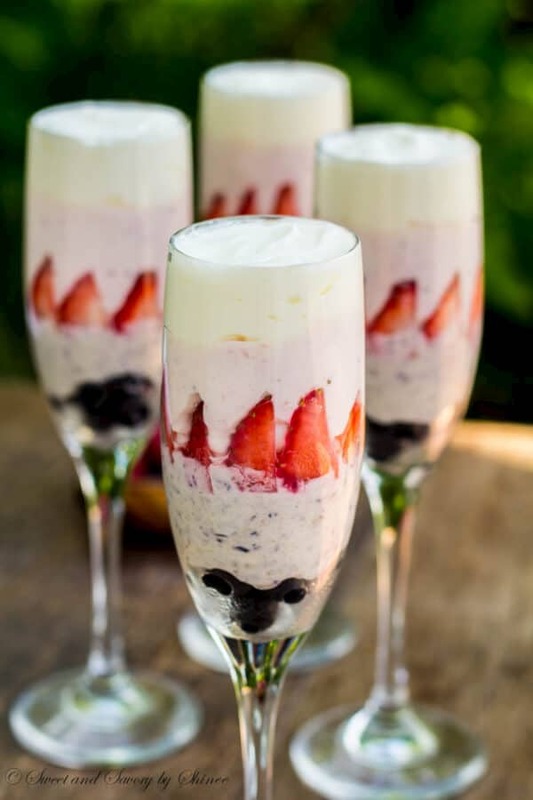 Fresh strawberries and blueberries cut the richness of the mousse beautifully. Hope you have a fun a safe 4th of July celebration with your loved ones. Let me know if you try this dessert. 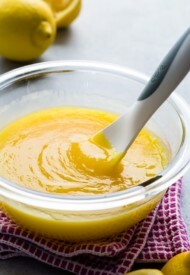 In a small dish, sprinkle the gelatin over 1 tablespoon of cold water. Let it stand for 5 minutes. In a mixing bowl, beat the remaining ½ cup of heavy cream until hard peaks form. Gently fold in the whipped cream into white chocolate mixture. 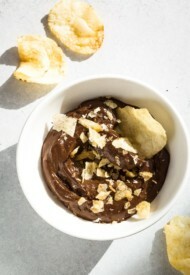 Divide the mousse into 3 equal parts in separate bowls. In a blender, blend blueberries and strawberries separately until smooth. Add blueberry sauce into one bowl, and add strawberry sauce into the second. Gently fold mixture. Put a few blueberries on the bottom of 5 Champaign flutes. Spoon some blueberry white chocolate mousse up to 1/3 of the way. Place slices of strawberries against the glass and then spoon some strawberry chocolate mousse up to 2/3 of the way. Top with plain white chocolate mousse. Refrigerate, covered with plastic wrap, until ready to serve, or for up to one day. This looks awesome! I am so glad i saw this recipe and decided to stop by. I am pinning this for later! Hi Shinee. 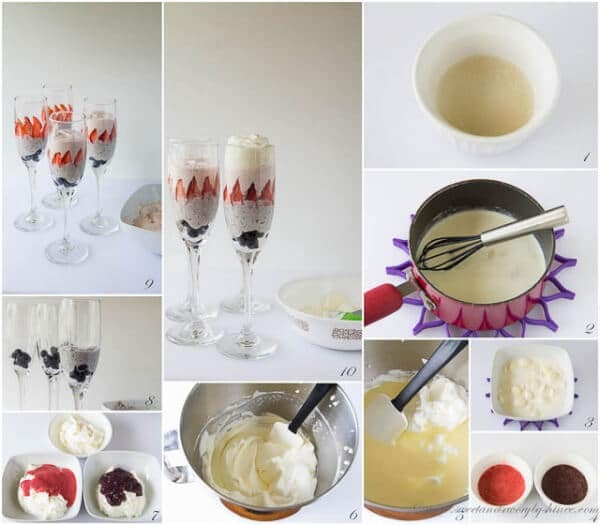 I saw your delicious white chocolate mousse recipe over at the Creative Ways link party and just had to check it out! Thanks for sharing and hope you have a fun 4th of July! Thank you, Heather! 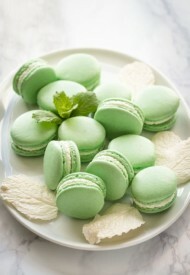 These are sure a treat! Happy 4th of July!! Pretty and elegant Shinee! Stopping by from Moonlight and Mason Jars LInky Party! 🙂 Pinning! Your presentation is so pretty! And using white chocolate is one way to sell me on anything! Delicious! Love the colors and can’t wait to try this. Thanks so much for sharing. The prefect treat for this time of year! I invite you to share this creative post at my Thursday Favorite Things Blog Hop. You can link up from Wednesday at 7PM (MST) to Sat midnight) Hugs! Such a great 4th of July treat. Love this!